Large or Small Gordon can entertain a crowd! A lot of performers will cringe when asked to perform for a room full of kids, this is where Gordon’s talent shines! 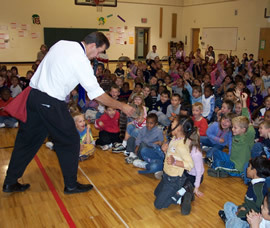 Gordon has traveled the globe providing hilarious magic, good times and excitement to family audiences of all sizes. Gordon has the ability to relate to kids, their humor, and what makes things fun. His shows are also entertaining for adults with jokes abo0ut the IRS, local city council and parenting seamlessly weaved into the show. 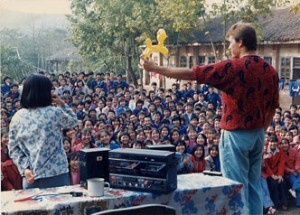 Gordon performs in Chengdu, China. A master at involving kids of all ages, Gordon and his puppet George Raccoon kept the kids squealing with delight!